Cart with continuous bent wood frame. White laminate shelves and white lacquered wheels. This trolley, designed for domestic use, derives from the simplification of the previously designed version with a basket. 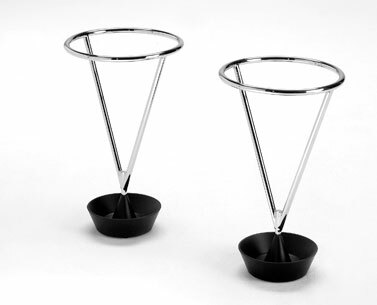 Umbrella stand with base in black lacquered metal fusion. Chromed drawn steel wire frame. AU90: Originally manufactured with brass base and structure in steel tube by Carl Auböck workshop, remained an hand made product manufactured, case by case, with little variations of the base joint and of the shape of the tube. This reproduction is the first mass production one, respectful of the original version. BR49: There are different models of a trolley among Breuer’s designs. The first definite date is 1928, when a photograph of the prototype of the version with three disk wheels was taken; in the same year, a version with spoked wheels, coded B54, was added to the Thonet catalogue, although it does not seems to have been produced. 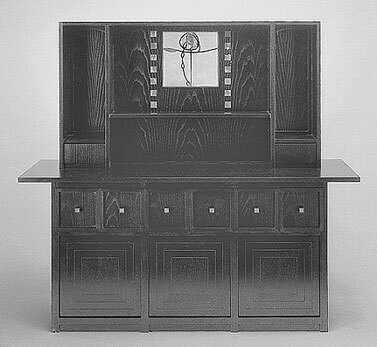 The version with three disk wheels was shown in public for the first time in 1930 at the Salon des Artistes Décorateurs in the "apartment for a boarding-house/hotel" designed by Breuer, who was present as a representative of the Deutscher Werkbund. It is portrayed in a photograph of the interiors for Boroschek’s apartment, and it appears later on, in 1931, at the Berlin-Bau Austellung in the "House for Sportsmen" designed by Breuer. In 1932, the Thonet catalogue offered a modified version with four wheels which cannot be attributed to Breuer. In 1935 the cart disappeared altogether in favour of other rather ordinary models with smaller wheels and no attribution. The trolley with three disk wheels appears in a photo of 1932 as an accessory in the kitchen of the Harnischmacher House I, in Wiesbaden. The disk-wheel trolley made its last appearance in the Highgate apartment for Mrs. Ventris, designed by Breuer in partnership with Francis Reginald York. An original trolley is shown at Neue Galerie, NY. Bookcase with four shelves in a variety of finishes: cherrywood/ashwood veneer, black/white laminate. Frame in chrome- plated tubular steel. Bookcase with five shelves in a variety of finishes: cherrywood/ashwood veneer, black/white laminate. Frame in chrome-plated tubular steel. BR10-4/5: This bookcase represents one of the most anomalous designs in Breuer’s linguistic research. The tubular steel is discontinuous and touchs the ground with two molded ends, cut and closed with a disk surmounting the section. 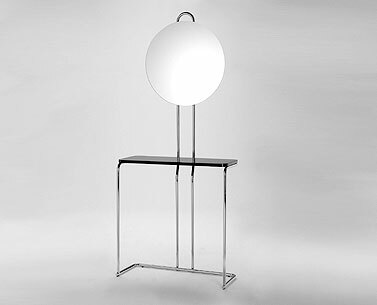 Designed between 1930 and 1931, it was originally produced in Switzerland in 1930 and sold in Zurich and Basel in the modern furniture stores owned by Sigfried Gideon, Werner Moser and Rudoldf Graber. In 1933 it was included in the collection designed by Breuer for Wohnbedarf. Cart with frame in chrome steel tube; ledges, wheels and joints in chromed brass. Top available in several finishes. Stool with chromed tubular steel frame. Seat in self-supporting expanded foam with non removable covering in leather. BR56: Present in the first catalogues Thonet of the ‘20s with the B114 code, it was probably realized on Breuer’s plan; subsequently Thonet will produce another version credited to Emile Guillot. Screen made in curved ash plywood panels, natural stained or open pore black lacquered; black or natural canvas strips joints. The screen, initially produced by Evans Products Company of Los Angeles in different widths and heights, was manufactured with red and black natural open pore finish. It remained out of production for many years. Wood lacquered in black polyester and polished to a high gloss finish. Connected by steel rods with polished brass endcaps. 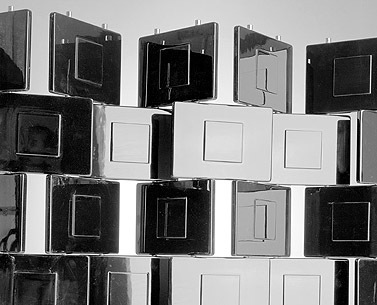 Eileen Gray designed various models of screens during her career. Amongst those of which a trace has remained, some are lacquered white, some others are black, with different heights and lengths, and smooth panels or with a rectangular relief on one side. Console with mirror. Chromed tubular steel frame. Top in MDF lacquered bright or matt. Height top from floor cm. 82. Pier-mirror with chromed tubular steel frame. Sideboard with frame in black lacquered ash with mother of pearl inserts and stained glass panel. MA00: The sideboard belongs to a group of furnishings supposedly designed for W.J. Basset Lowke’s country house, but never produced at that time. Documented by a pencil design and a watercolor found in the collection of the University of Glasgow, the drawings do not actually mention the client or the place for which the furnishings were destined. For the decorative leaded glass panel, which the original design does not detail, Mackintosh used the motif of the crying rose, designed by him in 1900 for the musician Michael Diak’s desk as well as other projects. 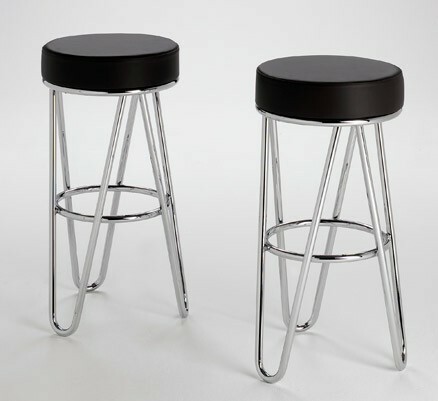 Stool with chromed flat bar steel frame. Seat in self-supporting foam with non removable covering in leather. Bench with hardwood top and base natural or black lacquered. NE77: This bed is part of a programm of the 1950s, in which Nelson developed a furniture series with essential lines of Scandinavian inspiration. It went out of production in the early 1960s. MI76: Philip Johnson, who cooperated with Mies to the plan for the Seagram Building in Lexington Avenue in New York, designed the fitting out for the Four Seasons restaurant, inaugurated in 1959. For the dining rooms, were used various chairs designed by Mies, such as the flat steel bar Brno chairs. For the counter of the bar, Mies designed a purpose-built stool, whose sitting was supported by a formal cantilevered continuous steel frame. The stools, originally realized only for the restaurant, are for the first time object of one mass production series. NE66: This bench is part of a system of unit furniture known as BCS, the basic cabinet series: containers, chests of drawers and cupboards mounted on feet or placed on benches, designed by George Nelson for Herman Miller, the company for which he was art director between 1945 and 1962. 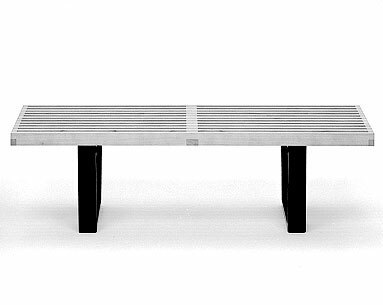 Originally available with various accessories, it owes its commercial fortune to the versatility that allows it to be used both as a bench and as a table or as a base for other containers. It went out of production in the early 1960s. NE76: This bench is part of a system of unit furniture known as BCS, the basic cabinet series: containers, chests of drawers and cupboards mounted on feet or placed on benches, designed by George Nelson for Herman Miller, the company for which he was art director between 1945 and 1962. Originally available with various accessories, it owes its commercial fortune to the versatility that allows it to be used both as a bench and as a table or as a base for other containers.It went out of production in the early 1960s. Bed with natural cherry frame. Beechwood stave. Base in chrome plated tubular steel. SA36/46: Vassar College, the institution based in Poughkeepsie, New York, commissioned in 1958 Eero Saarinen to design Noyes House, a crescent-shape dormitory whose parlor featured a flamboyantly sunken circular sofa that students quickly dubbed the passion pit. Within the lounge, around the circular parlor, Saarinen placed some of his previous designs, among then the “womb” chair. He also projected some specific furniture to fit the location: the fabric covered ottomans and the glass tables. 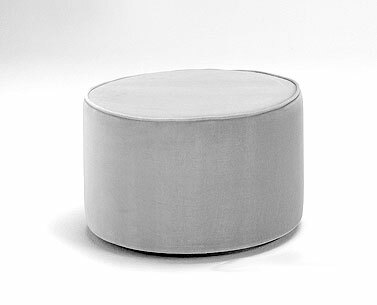 Pouf with wooden base and self-supporting expanded foam. Non removable covering in fabric or leather. Pouf with wooden base and self-supporting expanded foam. Not removable covering in fabric or leather. Ashtray, base in cast aluminium white or black. Tray in satin stainless steel. Chest of drawers with solid and veneered cherrywood frame and drawers. 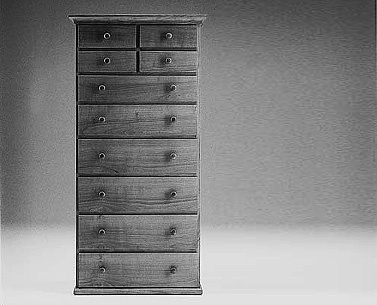 The Shakers produced containers, tables and chests of drawers in different sizes. Although proportions and details vary from piece to piece and are also different throughout the different communities, the common techniques and language distinguish them from any other contemporary American furniture.